This mid-term evaluation of the Partnerships for Enhanced Engagement in Research (PEER) is crucial to inform the next five years of the program. The evaluation will contribute to the Global Development Lab’s (Lab) objective to document to program effectiveness to better inform programming decisions through analysis and action-oriented recommendations for improvements in: (1) management and implementation; (2) stakeholder engagement; (3) results; (4) partnerships; and (5) strategies to promote PEER research application. The primary audience for this evaluation will be PEER staff and USAID senior management, National Academy of Sciences and Engineering (NAS) managers, United States Government (USG) Partners, and USAID Missions. To what extent is the PEER program being implemented efficiently? To what extent has PEER helped fill evidence gaps which influence policy/program change? 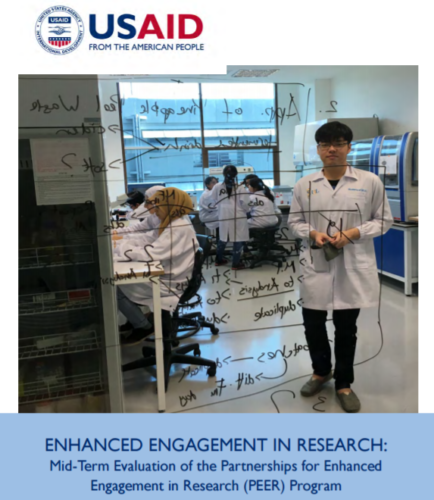 To what extent has PEER promoted collaborations between the US scientific community, local research institutions, host country governments, and USAID Missions and Embassy staff, and private sector partners? To what extent has PEER strengthened research capacity in developing countries? The evaluation also responded to many sub-questions broken into two categories addressing: (1) implementation performance and (1) program outcomes, which were incorporated into the data collection instruments and were used to answer the primary evaluation questions.